It might not sound exciting, but trust us, it is! Batgirl-themed cereal with purple multigrain O's. Includes Pocket Pop! Figure prize! 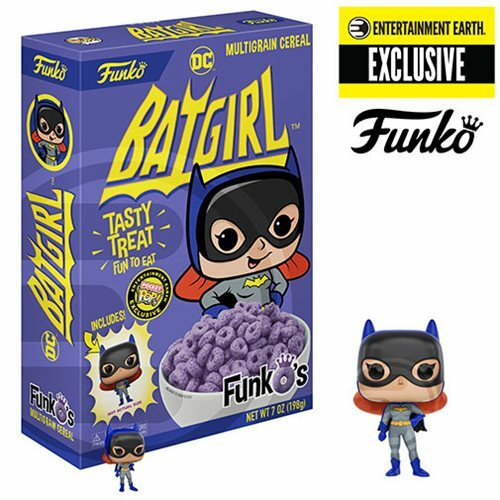 Entertainment Earth Exclusive - Breakfast with Batgirl! Make breakfast more fun! Pour yourself a tasty bowl of Funko's to start the day (or Netflix binge) off on the right foot. This treat gets even sweeter when you dig in to find the prize - a Pocket Pop! Vinyl Figure measuring approximately 1 1/2-inches tall! The toy is made in Vietnam. Cereal is packed and distributed in the United States. This Funko's Batgirl Pop! Cereal includes 7 ounces of multigrain cereal and the exclusive mini-figure!